Alright I get it, Facebook ad scare the crap out of you. But what if by not using Facebook ads you're actually leaving money on the table? 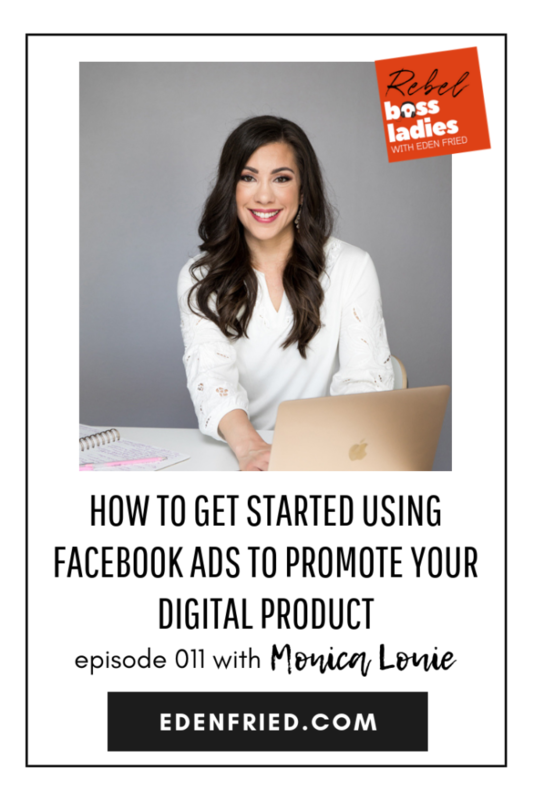 On episode 011 of Rebel Boss Ladies we have Monica Louie, a Facebook ad expert, and she's going to tell you all about how Facebook ads can transform your business and how you can get started. Facebook ads are an amazing tool to have in your toolbox so you can get your product in front of the right customers. If you're constantly feeling like you're burning your existing email list or you're launching to the same people over and over again, Facebook ads are going to help you get out of that and it’s going to help you reach the right people. Monica uses her expertise to help entrepreneurs skyrocket their profitability. After discovering the wonders of paid advertising on her own and seeing amazing results, Monica actually built a thriving agency for major brands and solopreneurs. Today, Monica is helping people just like you create Facebook ad campaigns. Monica found her way into the online business world after transitioning to become a stay-at-home mom. “I knew that I wanted to start my own business but I didn’t know what I could do, what I really could offer, but that’s when I started learning about blogging.” She loved the flexibility that working from home could offer. At the time of the transition, Monica and her husband also decided to be very intentional with their finances. Switching from two incomes to one made her feel really vulnerable, so they built up their savings. When these savings started to dip, Monica decided to use her experience and love of finance to build a business in the personal finance world. That was when Monica and her husband, at the age of 32, decided to become completely debt free by the time they were 40. “That gave us 8 years to pay off $320,000 of debt, and we just hit the ground running.” Incredibly, they were able to pay off $120,000 of debt in two years. Monica started with a few Facebook ads campaigns for herself to grow her webinar sign ups. Her initial cost per sign up was extremely low, but she was able to use what she had learned from this first ad campaign to create a more successful second campaign. Monica quickly lost her shyness, however, when she realized that not only was she getting amazing results for her different campaigns, she was also having a lot of fun doing it. She decided to sell her blog and transitioning to become a full-time Facebook ads coach. Why Are Facebook Ads so Important? Monica argues, however, that Facebook ads can be extremely powerful in helping digital product sellers reach the right people. “It’s just amazing, with over two billion active daily users on Facebook, your audience is likely there.” She works with clients to find their audiences on both Facebook and Instagram, which is a hugely growing platform. Facebook ads are great to both grow that warm audience, and also get your product offers in front of audiences that are more likely to buy. While email marketing is a great way to build a relationship with an audience, emails can often have low open rates, says Monica. The Budget: How Much Should You Spend on Your First Facebook Ads Campaign? Monica admits that deciding how much you want to spend on your first campaign can be a big question. Her agency works with all types of clients and budgets, some spending hundreds of dollars per day, and some spending only a few. She recommends first time Facebook campaigns start with a budget of between $10-30 a day. A big part of creating a successful ad campaign is testing. A larger budget means more testing, faster. Monica recommends using extra money in your budget to test different audiences or versions of the ad to see what is the most successful. If testing is the a big component in finding a successful ad strategy, how long should you test for? Monica recommends after you put the ad up, give the algorithm a little time to do its magic as it identifies who is engaging with your ad and uses that to show the ad to people who are more likely to click. “A common mistake is that people get a little bit nervous about spending money and think ‘oh no, my ad’s been up for three hours, it’s not working.” She advises waiting, at minimum, 3 to 4 days before adjusting your budget or changing anything about the ad. What Makes a Facebook Ad Successful? Monica stresses that an ad has two jobs. The second job of an ad is to entice people to take action. “Really think about structuring your ad,” Monica recommends. Make sure you identify what you want your audience to do, and that your ad is clear about how to do that. Perhaps you want your audience to watch a video, read a blog post or sign up for a webinar. “Your ad needs to entice them to click,” says Monica, and in the case of sign ups, “the ad needs to give them that information so that they’re ready to click and sign up.” She emphasizes that it’s important to structure your ad with your goals in mind. The second piece is finding the right audience for your ad. Sharing your people to the right people at the right time is essential. Finally, make sure you grab the attention of your audience. Even if you have a great offer and have found your audience, it doesn’t help if they don’t click. Monica recommends looking at these different elements anytime a campaign seems to be unsuccessful. Try testing different audiences, different variations of your ad, giving more information to entice people to take action, and more. “There are a bunch of different elements that you can test,” she recommends. What’s the easiest way to get started with Facebook ads? Monica recommends identifying the three elements: your offer and goal, your audience, and how to engage them creatively, and using that to build successful ads. Still nervous about getting started with Facebook ads? Monica has a freebie that can help with that.